today’s question: what makes a great portfolio site? every artist should have one! i think it’s important to have something to represent you when someone googles your name or company. it should be easy to navigate and give the user a clear idea of who you are and what you do. even if you’re just starting out and you’re not sure where you’re going. it could just be a tumblr site. something. anything. i think the best portfolio sites are the basic ones with no frills. nothing too precious or complicated. i just want to see your best projects and find your info. a potential client or employer just wants to click through quickly and be impressed. bri and i wrote about presenting your best projects in job interviews and to clients and the same advice goes for your site too. only show what you’re most proud of. show the projects that you want to keep doing. do you love doing illustrations? keep those on your site (and keep updating it)! when potential clients check it out, they will see illustrations and think that is what you like to do and want to keep doing. if you like doing multiple things, then include pages with individual projects within them. i also think it’s important to keep a couple of your best projects limited to your actual portfolio for interviewing. they will be refreshing when you’re meeting with someone who has already clicked through most of your work online. 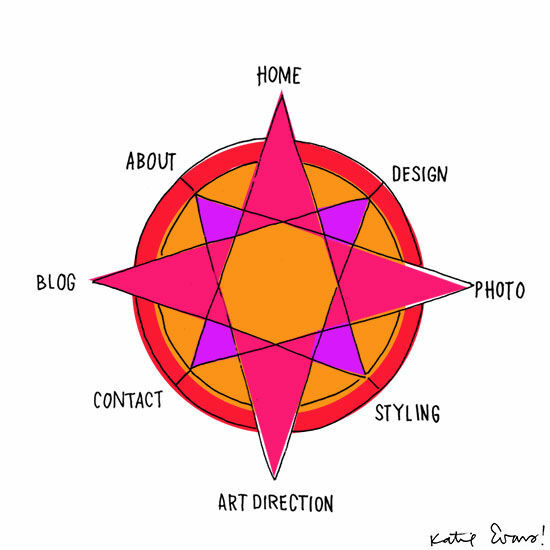 you could consider your online portfolio a summary of your physical one. don’t forget your page! i’ve been to many portfolio sites where i couldn’t figure out how to email the artist. then the moment passes and i forget about them. it’s a bummer. you don’t need to include your phone number or address; an email is totally fine. if you have a blog that involves what you do professionally, include it under there. it will be another avenue for someone to explore who you are even more. if it’s about your personal life…maybe save that for your family and friends. when i first started working on my portfolio site in college i thought it was really important that i build it from scratch. looking back i want to smack my 21 year old self and tell her not to waste all that time. i didn’t want to be a web designer or developer, so why drag myself through all that coding? i am now hosting with . it’s $60 a year and comes with great templates. what i love the most about them is that i can update my site from anywhere and on any device. the interface for uploading work and editing copy is so freakin easy. updating your portfolio can be a daunting task, but they make it quick. i like it and would highly recommend them. (hides under the table) well, this is embarrassing. i haven’t updated my graphic design portfolio in ages…but sometimes you can give better advice that you can take yourself, right? i truly belive that whatever you choose to focus on, with your whole heart, will be successful. if i was in a place where i wanted to do graphic design projects more often, i would be updating my site constantly. perfecting it. adding personal projects. things have shifted around a bit for me and i think of my blog as a portfolio for the types of projects i am working on now. clients can take a look at the partnerships i have done in the past and get a feeling for my brand. something that stands out the most to me on a portfolio site is the photography. if i am looking around for a florals designer to collaborate with for blogshop, they could have the most beautiful arrangements on their site but if the photos are bad there is a good chance i might skip right over them on accident. i know certain event planners that will only work with photographers that they know and trust…because they want to be able to share the photos after on their portfolio (i guess they learned this lesson the hard way after weeks of preparation and nothing to really show for it.) i admit to being lazy on this one and not setting aside a weekend to photograph my recent work the correct way. they always say it can be the hardest to work on your own brand! so i’d say you should hire a photographer to shoot your projects (have your clients send you samples of your work in action!) did you design a logo that was used in a restaurant? send someone over there to shoot it properly. did you style an event that you are really proud of? make sure to get the picture proof. did you design some amazing invitations? style them up nice. i love how does that! are you on behance? i’ve heard a lot of people get jobs from posting their work on there! i stumbled upon tonight and was impressed. so what do you say? are you inspired to go work on your portfolio now? have you been dragging your feet like i have? or have you come out with a portfolio you are super proud of lately? So we’ve talked about telling clients you’re raising your fees and how much to charge, etc but what about when a friend literally asks you to work for free for them? I.e. “Hey, we’re just starting out and need some photography/design/etc – you’ll do it for us right? We don’t have any money but we’ll buy you dinner!” When you know it’s going to be a lot of work and you’re not really in to it (nor really have the time for it), but you don’t want to hurt the friendship, what should you do? Just buck up and do it for free anyway? Is there any polite way to either turn them down or discuss a fair trade/price? Would love your thoughts on this!! I love this post. I am going to bookmark it for reference! I always dig these advice columns (SO MUCH!) and this one especially hit home, as I *just* *finally* got my personal site together. so while I’m partially hiding under the able with Bri, I do know that for me, I finally got it done because I had to put together a CV in order to apply for a studio space. Once that was underway, it really helped me highlight what kind of projects I did the MOST, and from there it was easier to figure out how to word all my bizness doings and figure out what should be highlighted on my site. it was the kick in the pants that I needed and might be a good starting point for anybody looking for one! Portfolio is a project that never ends, and it shouldn’t! I was recently reading about how important it is for graphic designs to write a few lines about the project too and now just show pretty photos. You’ve been working on something for months and you get it, but your client won’t see it the same way. Recently I’ve been eager to rush my portfolio so my write ups have been a bit disastrous but it’s super high on my priority list to go back and touch them up. I also reaaaaaallly want to emphasize on the SIMPLICITY factor again, so important. You want your work to shine, you don’t want a pretty colourful sidebar with 10 photos to be distracting from what actually matters. In art school we were very much encouraged to think outside of the box, even for online portfolios, however it is so dangerous. Think of all the different browsers and screen sizes people may look at your website from. Just because you have a 27inch imac doesn’t mean your potential client or employer will. My portfolio is still a work in progress but I’d love it if some of you were to check it out. I am always open to feedback and hearing what other people think! I’m quite happy with how the portfolio section is laid out right now. Thanks for all the inspiration! I’m always struggling with updating my own webpage, even when I’m a professional webdesigner, and I have to admit that my landing page is in work since ages. SO I’ll join you under the table, Bri, and I am determined to create a new one over the weekend. I owe you something for this! MaeMae Paperie is so great! It’s neat to see a place so close to home being featured on your blog. My sister interned there this summer. Thanks for the great advice! I just put together a landscape architecture portfolio and used Indexhibit to build it. It’s made specifically for artists/designers to showcase work in a gallery style format and I loved using it. Super easy to figure out too! thanks for this amazing post!! we are going to think about all this tricks! we are gonna try to start our own portfolio!! that will be super fun!! please, check our blog!!! I know it is in spanish, but inspiration has no language!! thankss Bri! you have a big fan from Spain here!!! Katie which template are you using on Cargo? I like your layout but can’t seem to find it! Oh, I love this post! The design program at my university did not have a class or workshop specific to creating a portfolio, so it is something I’ve been fumbling through and figuring out on my own post college. I just recently changed the look of my site – . I use Cargo Collective too. It is incredibly user friendly and clean looking. (I attended Blogshop in San Francisco this past November. I was able to apply so many of the skills I learned over that weekend to creating my portfolio site, as well!) My next step is creating a hardcopy piece to bring to interviews! Thanks for another great advice column! I couldn’t agree more about the need to have a good photographer to help represent your hard work. I’m a wedding photographer looking to branch out to more style and fashion for blogs. If you’re in the SF Bay Area looking for someone to collaborate with, shoot me an email! // [email protected] Thanks again for the great post! GREAT advice!! For anyone trying to build a great portfolio! Thanks! such a helpful post, thank you! and pretty good timing for me too. i’m still studying right now but should be putting together my first portfolio in a few months time! A good read. Been thinking of making my own instead of just a blog. I have an advice question: I’m freelance now and I just can’t decide if I should be llc or sole prop. Thoughts? Hi Bri and Katie! I’m a new reader and I just wanted to say how inspired I am with your advice for freelancers! Practically everything I’ve wanted to ask about freelancing is here. Thank you so much for giving newbies like me a starting point and lots of tips. Best of wishes! Good answers in return of this issue with firm arguments and describing all regarding that. transport water safely; as reputable plumbers they have experience in plumbing and electrical mechanisms. housing problems, give you peace of mind and keep you safe. Just as horses do, turn your back to the storm, keeping your house’s electrical should. Using solar vitality at home substantially reduces the need for dependence on electricity or fuel. This energy can be utilized to power up lights round the home in the evenings or when it is dark.